Whether it’s shaking hands, a racing heart or a lump that starts to grow in your stomach, we all know the annoying, nervous feeling and doubtful thoughts appearing before performing in front of a large audience. 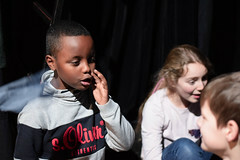 For kids involved in drama especially, stage fright becomes a natural part of the acting experience. I myself remember my fellow actors and I repeating our lines over and over before a performance, even though we knew them perfectly. One would think that once an actor gets enough experience in performing, the fear of performing would disappear. Surprisingly, practiced stars like Amanda Seyfried and Adele still experience stage fright to the same degree as they did in their first days surrounded by public attention. However, as performing has become a major part of their lives, they’ve learnt to develop their own strategies and rituals for handling their nervousness. Now, what if I told you that in the right amount, stage fright can actually help you to improve your performance? Since your body finds itself in a situation of stress, it produces a lot of adrenalin and you will feel far more energetic and concentrated. To actually take advantage of it, I have listed 8 tips that might help you to handle stage fright. Being prepared helps boost your confidence and helps you to feel more safe in front of an audience. If you know what you want to say, almost nothing can go wrong. An important step towards handling stage fright is accepting it. It’s ok that you’re nervous. This reaction proves that the outcome of the show is important to you. If you fight against it, your body will feel even more stressed and you will feel worse. To control your body’s reactions, meditation is a good way to go. Just find a quiet moment for yourself, close your eyes and take a few deep breaths before the show. Soon your body will calm down and you will get rid of all the distracting thoughts from your life outside the theatre too. Try to remove all negative thoughts from your mind that might make you feel uncomfortable. One common reason for stage fright is associating negative experiences with speaking in front of an audience. The more you try to keep postive, the easier it will be to not let the negative experiences get the better of you. Instead of paying attention to your nerves, try to focus on the message you want the audience to understand. If you don’t want to look at the faces in the audience, it might help to find a point in the room behind them to focus on. A lot of performers see their audience as enemies who are judging them. If you think of the audience as friends you want to perform with, you will not be afraid of being judged and it is much more fun to share your thoughts with them. Stage fright is the fear of failing and embarrassing yourself, but nobody is perfect and everybody makes mistakes. Since everybody knows this, nobody will blame you for them except you. Try to see the advantage in the mistakes you make and learn from them and improve next time.